In a recent study conducted by Gallup on global well being in 2010 reveals that of the 124 countries surveyed, majority population in only 19 countries -- mostly in Europe and the Americas -- considered themselves to be 'thriving'. And if we are to believe the Gallup study, then ONLY 17 per cent Indians feel that they are thriving. So much for all the tall talks of susequent givernments about how India is shining. Malaysia with all its oil money, and thriving tourism also had only 17 per cent of population as thriving. On the other hand, strife-torn Pakistan with its economy in tatters, boasts of 32 per cent of people who are thriving. While 13 per cent people are thriving in Bangladesh, Sri Lanka has lowly 5 per cent. Washington DC-based Gallup is a global provider of management consulting, human resources and statistical research services, with offices in 27 nations. 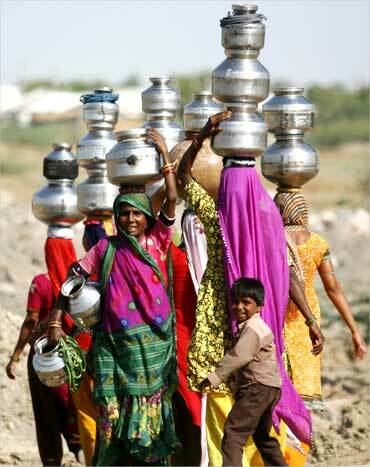 Image: Villagers carry pitchers filled with drinking water in Gujarat. In Asia, where a median of 17 per cent were thriving, there were large gaps between developed and developing Asian countries. China, which is supposed to surpass the US in a few years to emerge as the world's economic powerhouse, has only 12 per cent people who are thriving. Hong Kong on the other hand has 21 per cent. Yemen, Afghanistan, Armenia and Egypt, also, strangely have 12 per cent people thriving. And Japan, despite dropping to 3rd place in the list of nations with the highest GDP, has 26 per cent people who are thriving. 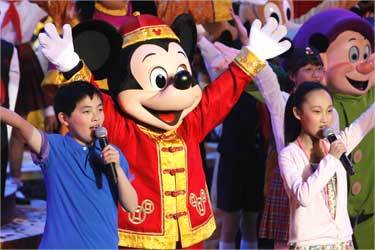 Image: Dancers perform during the groundbreaking ceremony of Shanghai Disneyland. Leaders, says Gallup, should not rely on GDP alone as an indicator of how well their countries and their citizens are doing. Monitoring and improving behavioral economic measures of wellbeing are important to helping leaders better the lives of all their residents. Leading the list of top 20 is Denmark with 72 per cent people thriving, followed by Sweden with 69 per cent. 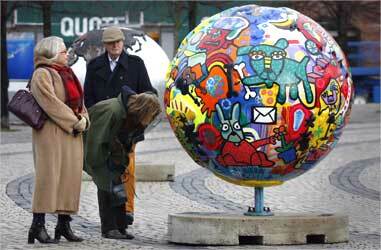 Image: Visitors look at an art installation representing the planet in downtown Copenhagen. While Canada also with 69 per cent is ranked third, Australia is at fourth position with 65 per cent people thriving. 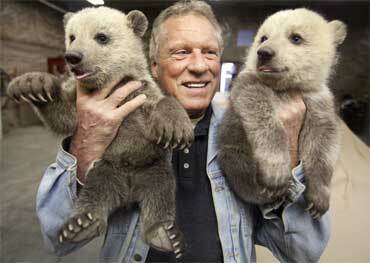 Image: Norman Phillips, owner and operator of the Northwood Zoo with 2 grizzly bear cubs in Seagrave Ontario. While 64 per cent people in both Finland and Venezuela are thriving, 63 per cent people are thriving in Israel and New Zealand. 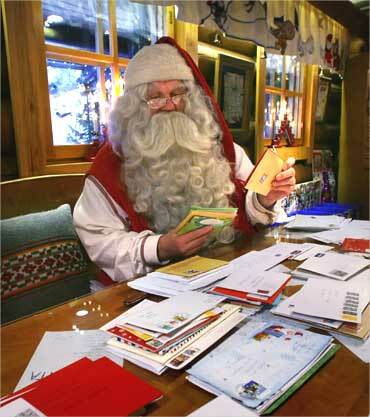 Image: A man dressed as Santa Claus looks over letters received at the Santa Claus Office in Rovaniemi, Finland. Both The Netherlands and Ireland have 62 per cent people who are thriving, while Panama has 61 per cent. Image: A woman and a child take part in a parade of pollera costumes in the City of Las Tablas, Panama. The US falls somewhat near the middle of the pack, with 59 per cent of Americans thriving. Global wellbeing improved little between 2009 and 2010. In Europe, the median percentage thriving in 2009 was 25 per cent, remaining essentially unchanged in 2010 at 28 per cent. Ten per cent in Africa were thriving in 2009, compared with 9 per cent in 2010. In Asia, the median remained flat at 18 per cent each year. In the Americas, the 42 per cent thriving in 2009 wasn't significantly different from the 39 per cent thriving in 2010. 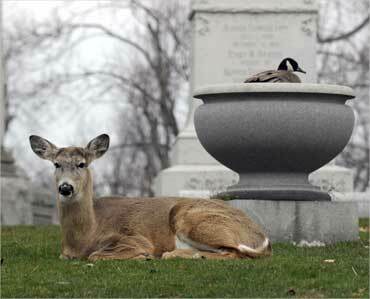 Image: A goose nests in an urn as a deer keeps a watchful eye at Forest Lawn cemetery in Buffalo, New York. While 58 per cent people in Austria and Costa Rica are thriving, Brazil, the only country among the five BRICS nations to find a place in the list of top twenty, has 57 per cent people who are thriving. 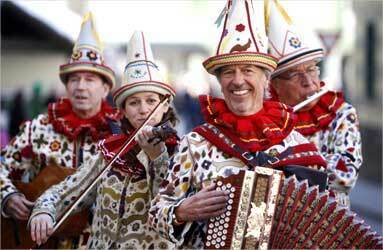 Image: Musicians dressed as traditional Flinserl participate in a carnival parade in Styria. United Arab Emirates, United Kingdom, Qatar, Mexico have 54 per cent, 53 per cent, 52 per cent and 51 per cent people who are thriving. 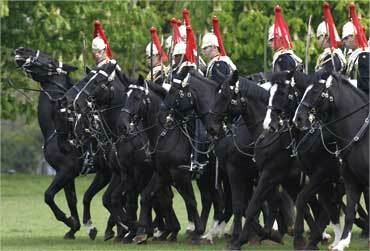 Image: Members of the Household Cavalry take part in a dress rehearsal in Hyde Park, London. Image: Zookeepers try to hold four Bengal White Tiger cubs in the Zoo Safari Park Stukenbrock in Bielefeld. While Russia boasts of 24 per cent people who are thriving, Kazakhstan , among the former Soviet nations scores the highest with 27 per cent people thriving. Data for Turkmenistan is not available. 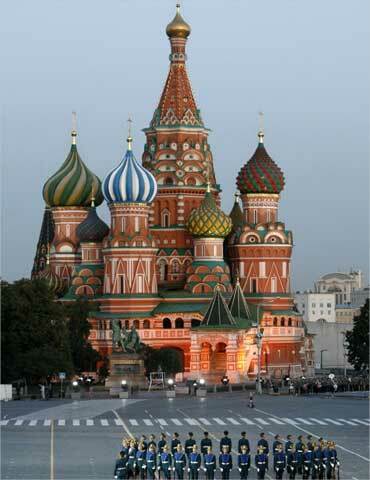 Image: Russian servicemen perform during a dress rehearsal in Red Square, Moscow. While data for Iran is not available, 43 per cent people in Saudi Arabia and 13 per cent in Iraq are thriving. Chad with just 1 per cent people thriving is at the bottom of the list. 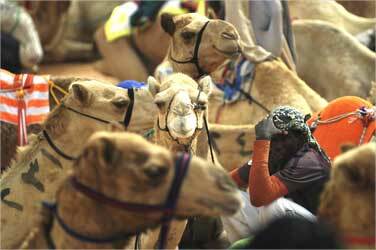 Image: A Saudi camel rider waits for the start of a camel race on the outskirts of Riyadh.